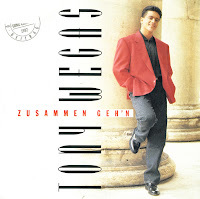 Tony Wegas was born as Anton Hans Sarközi on May 3, 1965 in Unterschützen, Austria. He was born in a Roma family. His father, who was a musician, learned him to play guitar, keyboards, drums, bass and panflute. He represented his country twice, during the Eurovision Song Contest in 1992 and 1993. He reached 14th place in 1993 with 'Maria Magdalena', and 10th place in 1992 with 'Zusammen geh'n'. I bought this single mostly because I was in Austria in 1992 and I stumbled on it. I didn't really particularly like this track. Tony Wegas had some problems in the second half of the Nineties. Being addicted to cocaine and heroin, he ended up in prison, being sentenced for 30 months in April 1997, after robbing two elderly women.